Caramel ice cream is the prettiest ice cream of all the ice cream. It’s prettiness was the main reason I wanted an ice cream maker. The combo of this frozen goodness and these cookies is love. That’s what all the silly arrows, asterisks and that heart mean. So after a few pep talks to myself and after reading through the recipe 57 times, I finally felt prepared to tackle all the sugar-melting and caramel-making. Anyway, when I tasted this caramel goodness, I immediately wanted something super chocolatey to pair it with. That’s how the double chocolate cookies came to be. Other tasty chocolate options: brownies, hot fudge, or chocolate biscotti. 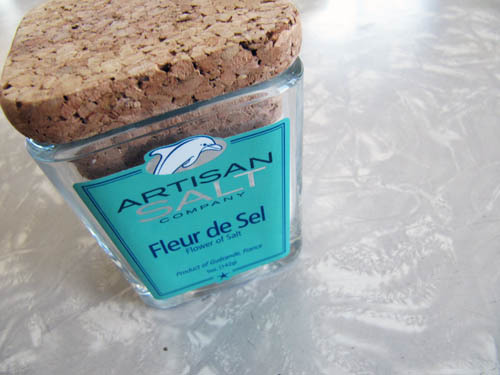 * Fleur de Sel is recommended, but if you don’t have kosher salt can be used. Make an ice bath by filling a large bowl about a third full with ice cubes and adding a a cup or so of water so they’re floating. Next, nest a smaller bowl at least 2 quarts in size over the ice. Pour 1 cup of the milk into the inner bowl, and rest a mesh strainer on top. 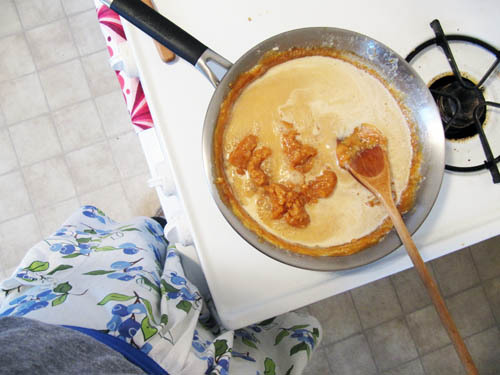 Spread 1 1/2 cups of sugar in a single layer in an unlined heavy duty sauce pan (I used a large skillet). Cook over moderate heat, until the edges begin to melt. Use a heat proof utensil (like a wooden spoon) to gently stir the liquefied sugar from the bottom and edges toward the center, stirring, until all the sugar is dissolved. Continue to cook, stirring infrequently until the caramel turns golden. Remove from heat when caramelized. Stir in the butter and salt, until butter is melted, then stir in the cream gradually. The caramel may harden and seize. It did for me (refer to 2nd photo). Try not to get too frustrated like I did, and just return to a low heat and continue to stir until the hard caramel is melted. Stir in the remaining cup of milk. Pour the custard through the strainer into the milk set over the ice bath. Add the vanilla, then stir frequently until the mixture is cooled down. Refrigerate for at least 8 hours or until thoroughly chilled. 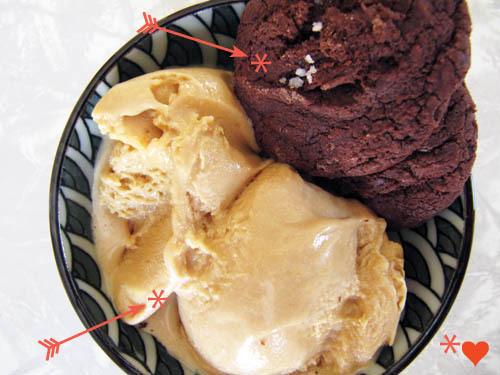 Freeze the mixture in your ice cream maker according to the manufacturers directions. Chill in the freezer until firm, at least 24 hours. NOTE: When I added the cream, all of the caramel seized and I had to stir it for quite awhile to melt the caramel. I may have wanted to give up, but I pushed through and I’m so glad I did. Also, this ice cream didn’t want to freeze super firm, but it turned out super caramel-y and tasty and was just the color I was dreaming of. 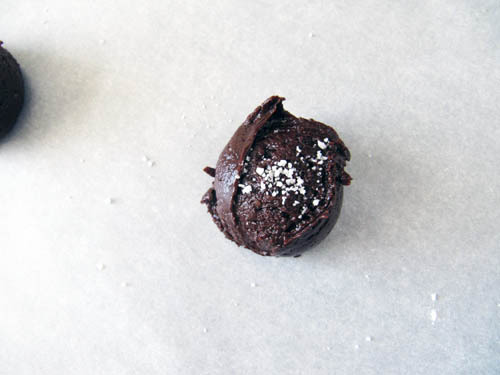 I sprinkled a pinch of Fleur de Sel on these cookies to pump up the salty sweetness of this dessert. Pump, pump, pump it up. 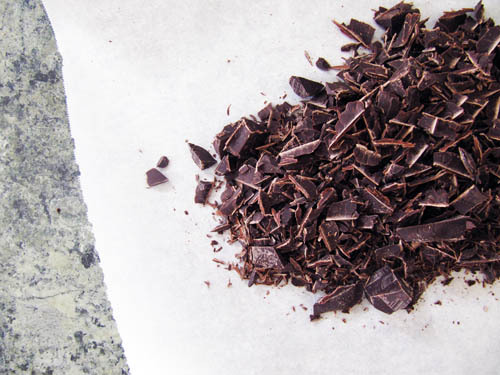 Placing the chopped chocolate on parchment paper for easy pouring into the double boiler bowl is the best idea ever. Why didn’t I think of that before in my life? Normally I clumsily transport the chocolate from the cutting board while spilling it on the floor and into my apron pockets. Preheat the oven to 325°F. Line a baking sheet or two with parchment paper. Set aside. Put the butter and half of the chocolate in a heatproof bowl over a saucepan of simmering water. Leave until melted and smooth. Beat the eggs, sugar and vanilla until well mixed. Add the melted chocolate mixture and beat until smooth. In a separate bowl, whisk the flour, salt and baking powder. Stir into the chocolate mixture, in three additions, mixing well after each addition, scraping any unmixed ingredients from the side of the bowl. Finally, stir in the remaining chocolate until evenly dispersed. 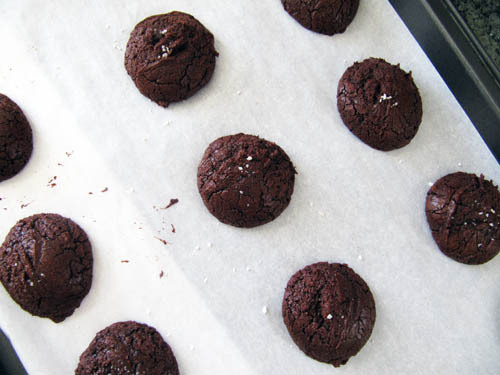 For small cookies like I made, drop the dough on the prepared baking sheet a teaspoon at a time, sprinkling with a bit of Fleur de Sel and baking for about 9 minutes or until crackled and set. Or if you want to make large cookies drop 12 equal amounts of cookie dough on the prepared baking sheet and bake for 10-15 minutes or until crackled and glossy. Whether you’re making big or small cookies allow the cookis to cool on the sheet a minute or two before transferring to a wire rack to cool completely. Use as a garnish for the caramel ice cream. * It was adapted mostly on accident because I didn’t read the directions well, and melted ALL of the 15 oz. of chocolate instead of melting half and then mixing in the other half later. Just know that it won’t ruin them if you have no regard to correct cookie-baking. 2. Oh.My.Stars. That dessert sound AMAZING! everything looks so tasty! but really, can you go wrong with caramel sauce, chocolate, and fleur de sel? no, no you can’t. Mmmmm! Yum! salted caramel and chocolate- a match made in heaven! 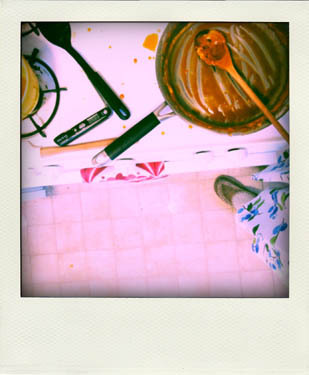 (I noticed the apron too:) Reminded me of something my grandma had! I need to make this ice cream. Ice cream making is the best! Oh, yum. I love caramel ice cream. Just so you know, the seizing-when-you-add-the-cream is normal, not something you did wrong; the sugar is over 300 degrees and solidifies when you add the much cooler cream (happens too if you add butter, or any other ingredient in whatever caramelly-yumminess you’re making). Just letting it simmer gently and stirring lackadaisically will bring about smoothness eventually as the sugar remelts. Can’t wait to make this and the cookies look like a great accompaniment! OOh, good to know! Thanks!